Not sure why but it seems that Dark Horse has been raising the prices of their artbooks. So my suggestion is for you to look around and see if there any cheaper options, such as on Book Depository or other places. 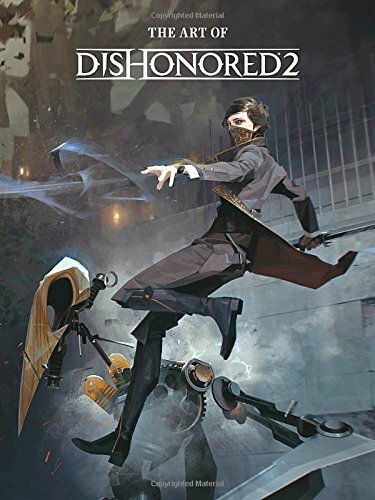 The book features the concept art for the characters, weapons, props and environments. Some pieces, especially the environments with buildings, are definitely 3D paint-overs and the digital painting is done really well. The light, shadow, atmosphere and textures are all captured beautiful. They are from Aime Jalon, Piotr Jablonski and other artists. There are also very detailed pencil sketches and graphite wash treatment (or it could also be digital paintings) for selected pieces drawn by Laurent Gapaillard. Composition of the locations, scenes are always carefully placed to show off the environment. The character art look great. Fully painted with portrait painting quality. Then there are weapons and props all painted with the same stylised look. There are some paintings as seen through Delilah eyes and those use strong solemn mysterious colours. They are actually painted by the artist Sergey Kolesov, who also contributed to many character paintings. All the artists are fantastic and and so is the whole book. This is a wonderful art companion to the game. I love the stylised painterly look. The quality is very similar to The Art of Uncharted 4: A Thief's End and The Art of The Last of Us, both of which are also published by Dark Horse.